(Kansas: Sedgwick County. Wichita, 37°69’10”N 97°30’19”W. Underground emergence. October 10, 2011). 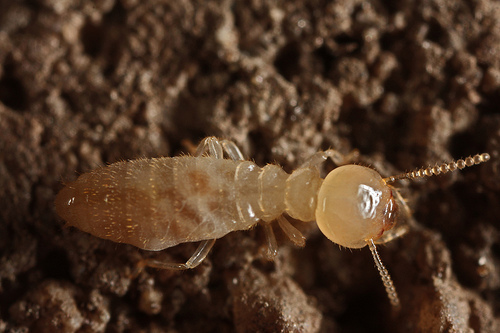 Diagnosis: Eastern subterranean termites are a eusocial insect, living in a caste system. Although the caste phenotypes differ, it is possible to identify to which species a member of a caste belongs by comparing it to similar castes of different species. Workers are approximately 1/8 inch long. They are soft bodied, wingless, and blind. They are also entirely a creamy-white or greyish-white color. Antennae are moniliform. Soldiers are the same size as workers only with much larger heads which possess sizable mandibles. They are similarly soft bodied, blind, and wingless. They are of a creamy-white color with slightly darker heads and mandibles. Antennae are moniliform. Reproductive forms are approximately 3/8 inch long and winged. Wings are deciduous; they are clear, membranous, narrow, and both pairs are of equal length to each other, although they are longer than the abdomen, and are kept folded on top of each other when not in flight. They are dark brown to black with pale tibiae. Eyes are similarly dark and antennae are moniliform. King and Queen are easily distinguished by their size, both being considerably larger than any of the other members of the colony. Queen subterranean termite and soldier above. Natural History: Being both a eusocial insect species and, consequently being hemimetabolis, the life cycle of Reticulitermes flavipes is not exactly straight-forward. 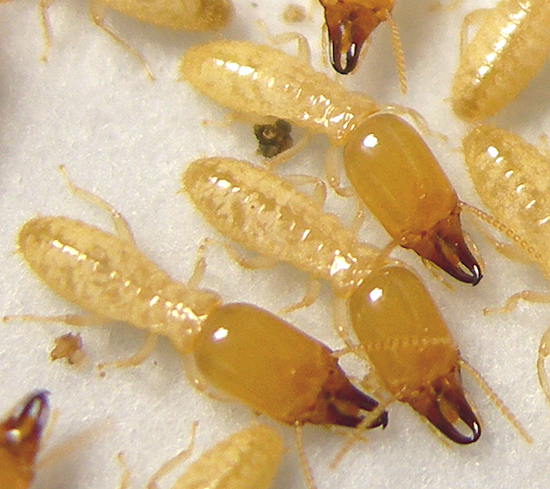 Beginning with a produced swarm of both male and female winged, reproductively active termites, a pair will fly off together to establish a nest. Upon landing, they tear each other's wings off and go underground. Once in their nest, the pair will mate, and the female will begin to lay eggs. The first group of eggs laid always gives rise to a number of sterile workers. Subsequent larvae may develop into either workers or soldiers. Other eggs will be nymphal eggs, developing into reproductive adults, which will then emerge in large numbers above-ground. The king and queen termite will continue to mate throughout the lifespan of the nest, having no other purpose than to populate it. Colonies may contain 60,000 - 200,000 individuals and survive up to ten years. Distribution: Found across roughly the eastern half of the United States in thirty-five states. Habitat: Subterranean; nests are established in the soil near some source of wood, constructing earthen tubes to them. They are also known to tunnel tree roots however when the ground is dry. Diet: Cellulose through the use of mutalistic microorganisms (protozoa mainly) within the digestive tract. The Cambridge Natural History: Insects, Vol. 1. David Sharp. ©1970 by Dover Publications, Inc. The Life of the White Ant. Maurice Maeterlinck. Translated by Alfred Sutro. ©1927 by Dodd, Mead & Company, Inc.
Insect Pests. George S. Fichter. ©1966 by Western Publishing Company, Inc.